21/02/2017 Her Majesty Queen Rania Al Abdullah honored sixty-seven schools as recipients of the Healthy Schools National Accreditation for the academic year 2015-2016. Under the patronage of Her Majesty, the Royal Health Awareness Society (RHAS) held an interactive two-day workshop at Al Bayader Secondary Vocational School for Girls to publically recognize the past academic year’s accredited schools. The project aims to foster health conscious environments within Jordanian schools by ensuring their adherence to national health standards. 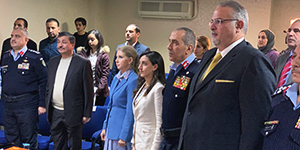 In the presence of the Minister of Health, Dr. Mahmoud Al-Sheyab, and the Minister of Education, Dr. Omar Al-Razzaz, the Queen congratulated the accredited schools, commending their efforts in elevating their students’ well-being and positively impacting their home and learning environments. Her Majesty said that the program’s success has been a collaborative effort resting on several parties, including, schools, parents, the local community, the Ministry of Health and the Ministry of Education, and RHAS. She also underlined the importance of continuously reviving these accomplishments and enlarging the circle of success to encompass a greater number of participating schools. The Queen commenced her visit with a stop at a healthy food preparation station headed by Chef Jamie Oliver’s Super Ambassador, Chef Mira Jarrar. Her Majesty observed Chef Jarrar introduce the girls to basic healthy food preparation methods, and arbitrate a friendly competition between them. 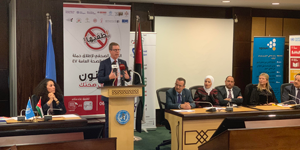 The school’s teachers were invited to join Her Majesty in a brief and informal discussion on the necessity of promoting healthier practices within Jordanian schools, voicing their support of RHAS’s accreditation program and the benefits reaped as a result. Parents and guardians also partook in a separate discussion with The Queen. A number of member-parents of the school’s health committee highlighted their roles in advocating the program’s objectives and complementing the school’s efforts by maintaining similar health standards at home. RHAS Director General, Hanin Odeh, delivered remarks followed by a video reflecting back on the program’s interactive workshop that was held at the school. Attendees including teachers, local community members, and school staff were given the opportunity to share their personal experiences with the program, and encourage others present to consider adopting its practices. The Healthy Schools National Accreditation program was first implemented by RHAS in 2008 in partnership with the ministries of health and education. Depending on their overall accreditation scores and the duration of their participation in the program, schools are recognized as recipients of either the bronze, silver, or gold levels of accreditation. Of the 67 schools that were honored, 8 received the gold accreditation, 19 received the silver accreditation, and 40 received the bronze accreditation. Many think that if you swallow chewing gum it can get stuck in your gut for many years. Not true. 2 weeks max.